This course builds on students' previous experience with functions and their developing understanding of rates of change. 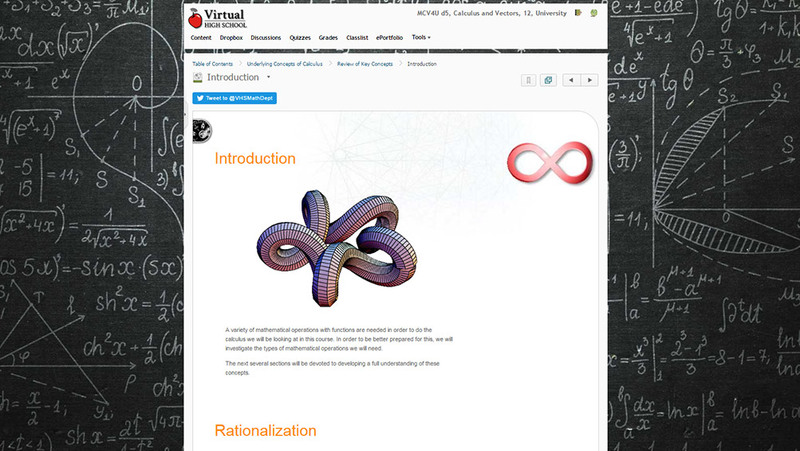 Students will solve problems involving geometric and algebraic representations of vectors and representations of lines and planes in three dimensional space; broaden their understanding of rates of change to include the derivatives of polynomial, sinusoidal, exponential, rational, and radical functions; and apply these concepts and skills to the modelling of real-world relationships. Students will also refine their use of the mathematical processes necessary for success in senior mathematics. This course is intended for students who choose to pursue careers in fields such as science, engineering, economics, and some areas of business, including those students who will be required to take a university-level calculus, linear algebra, or physics course. There are four main topics pursued in this initial unit of the course. These topics are: an introduction to vectors and scalars, vector properties, vector operations and plane figure properties. Students will tell the difference between a scalar and vector quantity, they will represent vectors as directed line segments and perform the operations of addition, subtraction, and scalar multiplication on geometric vectors with and without dynamic geometry software. Students will conclude the first half of the unit by proving some properties of plane figures, using vector methods and by modeling and solving problems involving force and velocity. Next students learn to represent vectors as directed line segments and to perform the operations of addition, subtraction, and scalar multiplication on geometric vectors with and without dynamic geometry software. The final topic involves students in proving some properties of plane figures using vector methods. Cartesian vectors are represented in two-space and three-space as ordered pairs and triples, respectively. The addition, subtraction, and scalar multiplication of Cartesian vectors are all investigated in this unit. Students investigate the concepts of linear dependence and independence, and collinearity and coplanarity of vectors. Applications involving work and torque are used to introduce and lend context to the dot and cross products of Cartesian vectors. The vector and scalar projections of Cartesian vectors are written in terms of the dot product. The properties of vector products are investigated and proven. These vector products will be revisited to predict characteristics of the solutions of systems of lines and planes in the intersections of lines and planes. This unit begins with students determining the vector, parametric and symmetric equations of lines in R2 and R3. Students will go on to determine the vector, parametric, symmetric and scalar equations of planes in 3-space. The intersections of lines in 3-space and the intersections of a line and a plane in 3-space are then taught. Students will learn to determine the intersections of two or three planes by setting up and solving a system of linear equations in three unknowns. Students will interpret a system of two linear equations in two unknowns geometrically, and relate the geometrical properties to the type of solution set the system of equations possesses. Solving problems involving the intersections of lines and planes, and presenting the solutions with clarity and justification forms the next challenge. As work with matrices continues students will define the terms related to matrices while adding, subtracting, and multiplying them. Students will solve systems of linear equations involving up to three unknowns, using row reduction of matrices, with and without the aid of technology and interpreting row reduction of matrices as the creation of new linear systems equivalent to the original constitute the final two new topics of this important unit. A variety of mathematical operations with functions are needed in order to do the calculus of this course. This unit begins with students developing a better understanding of these essential concepts. Students will then deal with rates of change problems and the limit concept. While the concept of a limit involves getting close to a value but never getting to the value, often the limit of a function can be determined by substituting the value of interest for the variable in the function. Students will work with several examples of this concept. The indeterminate form of a limit involving factoring, rationalization, change of variables and one sided limits are all included in the exercises undertaken next in this unit. To further investigate the concept of a limit, the unit briefly looks at the relationship between a secant line and a tangent line to a curve. To this point in the course students have been given a fixed point and have been asked to find the tangent slope at that value, in this section of the unit students will determine a tangent slope function similar to what they had done with a secant slope function. Sketching the graph of a derivative function is the final skill and topic. The concept of a derivative is, in essence, a way of creating a short cut to determine the tangent line slope function that would normally require the concept of a limit. Once patterns are seen from the evaluation of limits, rules can be established to simplify what must be done to determine this slope function. This unit begins by examining those rules including: the power rule, the product rule, the quotient rule and the chain rule followed by a study of the derivatives of composite functions. The next section is dedicated to finding the derivative of relations that cannot be written explicitly in terms of one variable. Next students will simply apply the rules they have already developed to find higher order derivatives. As students saw earlier, if given a position function, they can find the associated velocity function by determining the derivative of the position function. They can also take the second derivative of the position function and create a rate of change of velocity function that is more commonly referred to as the acceleration function which is where this unit ends. In previous math courses, functions were graphed by developing a table of values and smooth sketching between the values generated. This technique often hides key detail of the graph and produces a dramatically incorrect picture of the function. These missing pieces of the puzzle can be found by the techniques of calculus learned thus far in this course. The key features of a properly sketched curve are all reviewed separately before putting them all together into a full sketch of a curve. A variety of types of problems exist in this unit and are generally grouped into the following categories: Pythagorean Theorem Problems (these include ladder and intersection problems), Volume Problems (these usually involve a 3-D shape being filled or emptied), Trough Problems, Shadow problems and General Rate Problems. During this unit students will look at each of these types of problems individually. This unit begins with examples and exercises involving exponential and logarithmic functions using Euler's number (e). But as students have already seen, many other bases exist for exponential and logarithmic functions. Students will now look at how they can use their established rules to find the derivatives of such functions. The next topic should be familiar as the steps involved in sketching a curve that contains an exponential or logarithmic function are identical to those taken in the curve sketching unit studied earlier in the course. Because the derivatives of some functions cannot be determined using the rules established so far in the course, students will need to use a technique called logarithmic differentiation which is introduced next. A brief trigonometry review kicks off this unit. Then students turn their attention to special angles and the CAST rule which has been developed to identify which of the basic trigonometric ratios is positive and negative in the four quadrants. Students will then solve trigonometry equations using the CAST rule to locate other solutions. Two fundamental trigonometric limits are investigated for the concepts of trigonometric calculus to be fully understood. The unit ends, as in all other units in the course, with an assignment and a unit quiz. Note:This course is entirely online and does not require or rely on any textbook. A non-programmable, non-graphing, scientific calculator. A3 verify graphically and algebraically the rules for determining derivatives; apply these rules to determine the derivatives of polynomial, sinusoidal, exponential, rational, and radical functions, and simple combinations of functions; and solve related problems. B2 solve problems, including optimization problems, that require the use of the concepts and procedures associated with the derivative, including problems arising from real-world applications and involving the development of mathematical models. C4 represent lines and planes using scalar, vector, and parametric equations, and solve problems involving distances and intersections. Problem solving: This course scaffolds learning by introducing concepts and relating them back to concepts that were taught in prior units and mathematics courses. The course guides students toward recognizing opportunities to apply knowledge they have gained to solve real-world problems. Selecting Tools and Computational Strategies: This course models the use of 3D graphing software to help solve problems and to familiarize students with technologies that can help make solving problems faster and more accurately. Connecting: Students will connect concepts learned in this course to real-world applications of Vectors and Calculus through assignments, examples, and practice problems. Reflecting: This course models the reflective process. Through the use of examples and practice exercises, the course demonstrates proper communication to explain intermediate steps and reflect on solutions to determine if they make sense in the given context. Representing: Through the use of examples, practice problems, and solution videos, the course models various ways to demonstrate understanding, poses questions that require students to use different representations as they are working at each level of conceptual development - concrete, visual or symbolic, and allows individual students the time they need to solidify their understanding at each conceptual stage.